I grew up back in the era before there were trophies for everyone. Only the best softball team got a trophy (even when I was in elementary school), only the top animal at the fair got the blue ribbon (true still today), and there were no consolation ribbons if you got eliminated from the spelling bee. 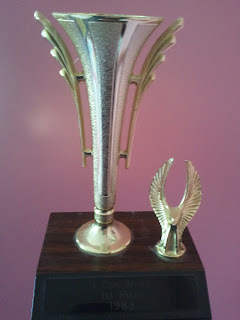 Back in 198-something when I was just a young nerd, I entered my first writing contest. It was a K-5 contest at Farmersville Elementary School and I entered a story I had written based on something that really happened when we were on vacation at the lake. Although, the plot had been altered to include several of my spelling words. I won the "I Can Write" contest, beating out other kids who were older. I knew then that writing would be part of my future. That writing would be part of my career. I have since won a whole shelf full of awards for my communications work. Some awards were for team efforts, some for my own writing. But I keep this nearly 30-year-old trophy on a shelf in my bedroom. Some days when cranky clients insist I use the phrase innovative, game-changing solutions or submissions to the boss come back covered in red ink, I remember. I Can Write.